Blaklion produced a gutsy performance to win by half a length from 16/1 shot Shaneshill. The 8/1 chance, trained locally by Nigel Twiston-Davies, jumped and travelled well for jockey Ryan Hatch and hit the front with a magnificent leap at the last with several of the field still in with a chance. The seven-year-old battled tenaciously to fend off a challenge from the runner-up and his trainer was understandably delighted after the race. 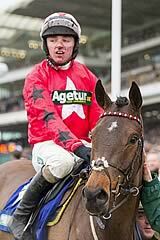 “That was unbelievable,” said Twiston-Davies. “He’s done all his winning on heavy ground but I had a nagging feeling that, because he’s small, better ground might suit him and I think it has. “Funnily enough, he hasn’t put a foot wrong since he fell here back in November (at the Open meeting). It’s horrible. We don’t like falls, none of us do, but it’s been the making of him. “He’s so scopey, he can go long at a fence, he can go short – he does everything right now. I wasn’t worried about the fact that he had a hard race last time out at Wetherby (won the Towton Novices’ Chase on heavy ground) – it’s up to me as a trainer that it doesn’t leave a mark. “Ryan rode him beautifully. He should have been claiming three pounds but he wasn’t. What a good ride – I’m delighted for him. We were in a bit of a pocket at the bottom of the hill and he’s a stayer so I was a bit worried then. He quickened well and the gaps opened well for him so it was all good. “The boys in the yard do all the work so we try and keep all the rides split between them. Ryan is very patient in a race and very good over a fence – I usually let his ride do the talking. “Let’s hope Blaklion keeps on improving. He’s not as big as Young Hustler (who won this race for Twiston-Davies in 1993) or Imperial Commander (won the Timico Cheltenham Gold Cup in 2010) but you can’t argue with what he’s done today. Willie Mullins was pleased with the run of 16/1 shot Shaneshill, who finished a game half-length second to Blaklion. Having travelled near the back of the field, the seven-year-old made stealthy progress to challenge the winner all the way up the hill. Mullins said: “It was a fantastic run from the horse and I am very happy with that. We elected to sit and wait with him in this race and it worked well. The Jonjo O’Neill-trained, J P McManus-owned More Of That, sent off 6/4 favourite, was reported to have burst blood vessels in both nostrils. He finished third, eight lengths behind Shaneshill.